Trinity Designs: A Promise Kept! I started wondering what could I emboss in black without being depressing? Music, of course! So, I grabbed my Music Notes wheel and my Wheel Guide (so I'd roll it straight!) and inked up the wheel with Versamark. I rolled it twice across a piece of Very Vanilla cardstock 4 1/4" x 11" that I'd rubbed with my Embossing Buddy - to prevent static which would put Black Embossing Powder in places that it didn't belong! No one wants that! 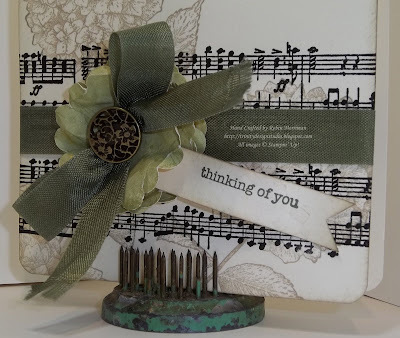 Next, I dumped the black powder over the stamped music notes (I could have told you I gently poured it over, but that would be lying because just about the whole container dumped out on my poor card when I was applying it! Sheesh!) Anyway, after tapping off the excess and embossing with my Heat Tool, I had some lovely black music notes. Now what to do with that? Hmmm. I knew I didn't want this card to be masculine or depressing so I pulled out my Because I Care stamp set that hadn't seen ink in ages! I inked up the big, beautiful Hydrangea stamp with Crumb Cake and did some random stamping all over the card front with it. LOVE how that turned out! I also sponged the edges with Crumb Cake because, well, because I just had to, that's why. I dunno, just go with it. So, what to do about color? I didn't want bright or somber, but something soft and warm, so I went with two greens - Pear Pizzazz from the Botanical Gazette DSP and Always Artichoke Seam Binding. I punched four scallops out of the green DSP with my 1 3/8" Scallop Circle Punch and crumpled them all up to age them a bit. Then I sprayed on a little Gold Smooch Spray - it's just not showing up well in the photos. I punched a hole in the four scallops and ran my ribbon through them from the back after I'd slipped it under the folded card front. I cinched it up and tied the bow on top of the "flower" so the ribbon would be pretty on the inside of the card too and not have unfinished ends. The Antique Brad presented a problem attaching it until I took a pair of wire cutters and snipped off the prongs. Ha! That'll teach it! It's stuck down with Mini-Glue Dots just like the little banner I stamped with Teeny Tiny Wishes. It was wonderful to sit down and create again from scratch! Hard getting started, but really great to create something that I love. And I do love this card. I'd also love to know what you think about it too, so leave me a comment and share, ok? I'll be back tomorrow with something else pretty for you - don't know what yet, but I'll be back - I promise! Wow, this card is beautiful, very elegant, love the softness of the hydragena's and then the black musical notes. The ribbon really dresses this card up, a beautiful piece of art. Robin, this is gorgeous! I am so glad you persevered and stamped. I know you have so much on your mind and tuggings at your heart. We are all here for you!!! P.S. I'm glad things went well for dad's first treatment. Are you around tonight for a short chit chat? Well, Robin, I had no deal all this was going on with your dad. Please know that he and your family are in my thoughts and prayers. Your card is BEAUTIFUL...I love it! That is really pretty. I love the image stamped in crumb cake. Such a beautiful card! Love how it turned out!!! Makes me want to get my music note wheel out and do something with it!!! What a stunning creation! 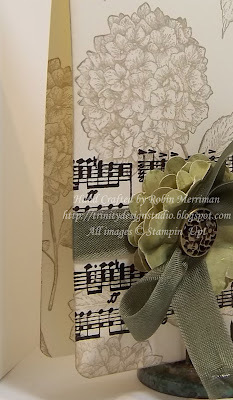 It is inspirational to me to see the music note and the lovely embellishments. I really like the way the hydragenas were done in Crumb Cake, something I would never think to do. This is amazing! Love how you incorporated the music! This is so beautiful!! I just purchased that Musical Notes wheel (thanks to Kimberly!!) and used it last weekend at my stamp class! I love it!!!! Robin, your card is absolutely stunning...love the crumb cake hydrangeas...everything is so well balanced. Sending prayers for your dad and entire family. You've raised a beautiful daughter in Emma. Your gift of honesty and faith to her will help her tremendously. I can tell she is very blessed to have you as her mom. Absolutely beautiful. Love everything about it! Thanks for sharing. Gorgeous card. 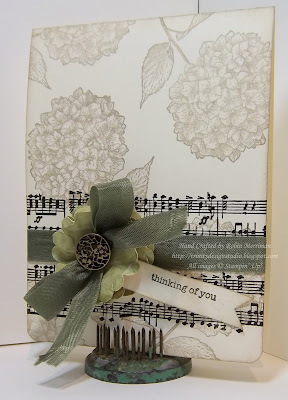 Love the music notes and the way you stamped the Hydrangea. Also love your ribbon treatment. Absolutely beautiful! You are amazing! Gorgeous! That wheel is still on my wishlist. Very Elegant, yet could be used for a masculine card also.. appropriate for any occasion. Nice job Robin!! Hi Robin! This card is beautiful!! I love everything about it!